If you have an iPhone 6 or later, start by adding your Bank of Canton cards to your Wallet app. Once they’re authenticated, you’re ready to make electronic payments from your Bank of Canton accounts wherever Apple Pay is accepted. Apple Pay® lets you make secure purchases with your Bank of Canton debit and credit cards in stores, in apps and online, using just your iPhone® or Apple® device. 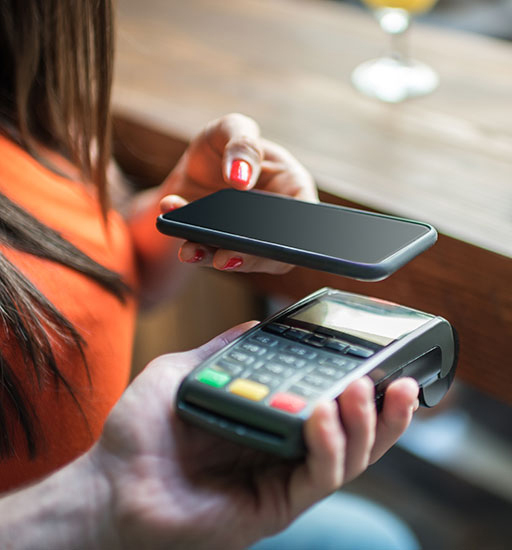 When you pay with Apple Pay, your card details aren’t shared with the merchant. Instead, they’re replaced with a unique device code and your Touch ID® or passcode. Apple doesn’t retain your card info on its servers or on your device, so your payments and payment history remain secure and private. To use Apple Pay in stores with your iPhone, just hold your iPhone within range of the contactless payment reader at checkout. Your default payment card will appear on the screen. If your Bank of Canton card is your default card, put your finger on the Touch ID to pay. If your Bank of Canton card is not your default card, tap your cards and switch to your Bank of Canton card. Then put your finger on the Touch ID to pay. The display will show a checkmark and the word “Done” once the transaction is complete. It’s that simple. Our Help Center FAQs offer additional links and information about Apple Pay.